I get so frustrated when I feel like I'm always running behind. Sometimes, it seems like I can't keep up no matter how hard I try. Every time I get one thing accomplished, I turn around to find a mountain of things just waiting for me to conquer. You've been there too, haven't you? I don't know about you, but for me this causes stress. When it goes on for long periods of time, it causes chronic stress. Chronic stress puts your health at risk. It can wreak havoc on your mind and body. With chronic stress you have an increased risk of anxiety, depression, digestive issues, heart disease, sleep problems, weakened immune system, weight gain, memory & concentration impairments and more. I've been a massage therapist since 2007, I've seen what chronic stress can do to a person. I'm going to share some ideas with you that I have personally implemented into my life as well as a few things I have noticed that have tremendously helped clients and friends of mine. Everyone reacts differently to stressors, in that same regard, some of these tips may be more useful to you than others. If you have any additional tips that have helped you, I would love for you to comment below. To help me conquer the frustrations of always feeling like I'm running around like a chicken with my head cut off, I have started planning more diligently. These two things have made a tremendous difference in our stress levels due to daily activities. My husbands' schedule is ever changing. My schedule isn't much more constant. 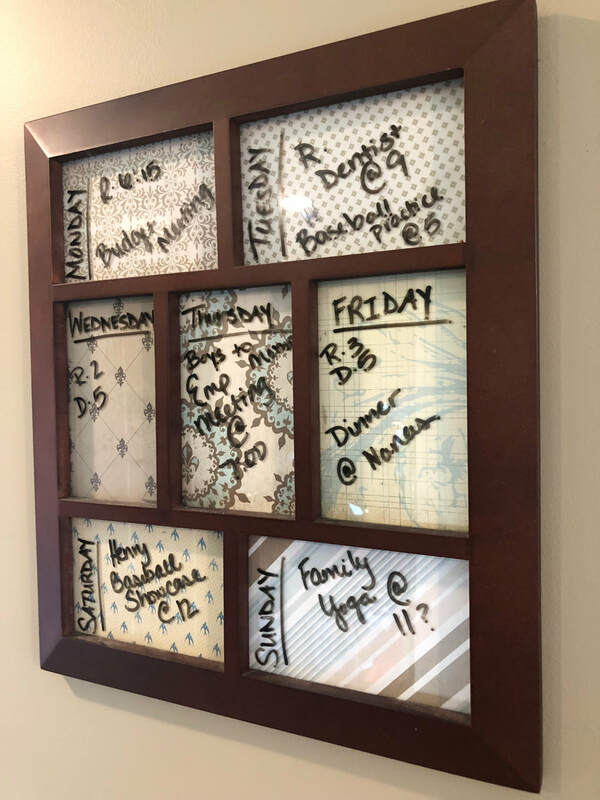 Then, throw the activities of our children into the mix.... We sit down on Sundays and fill out our board for the week ahead. We are able to see who will be where, what days we need additional child care, and hopefully, what day we can do something fun together. It's nothing fancy, but it gets the job done. A simple system is key here. In addition to our Weekly Planning Board, we do a Weekly Menu. 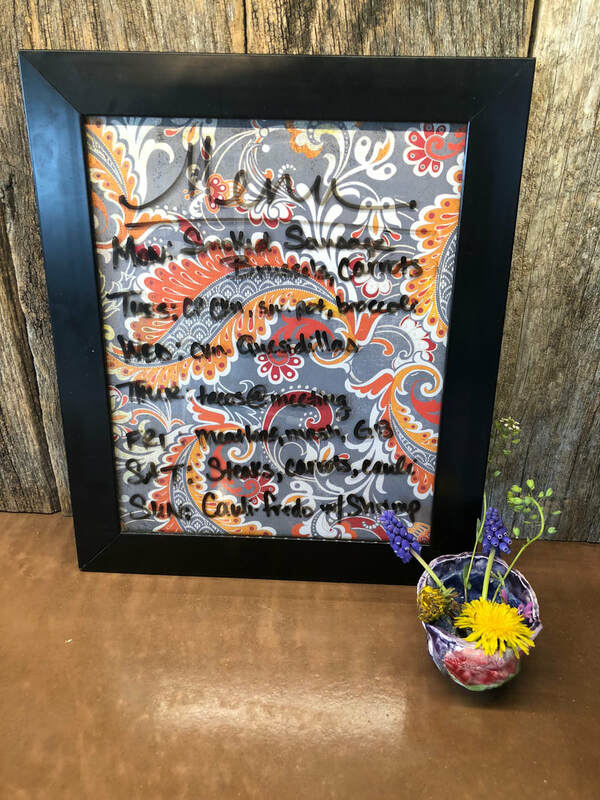 Our menu board has been a life saver, not only for our sanity but our budget, as well. I don't know how many times I had come home from work at 5 or 6pm, the boys are starving, I'm scrambling around in the kitchen trying to create a healthy meal with random ingredients in under 10 minutes. Stressful. While we are filling out our Weekly Planner we fill out the menu according to our schedules, then grocery shop according to the list. The menu has reduced stress in the evenings and allowed us to have a more balanced diet. This board is also just a picture frame with fun paper and a dry erase marker. Diet & Exercise is something we could spend hours talking about, but let's just touch on it for a minute. Exercising is a fabulous stress reliever! I'm not saying you need to become a marathon runner, but scheduling small things, like a 30 minute walk in the evening, will help you lower your stress level. Diet can play a key role in stress as well. Eliminating processed foods and making healthy choices will give your body the vitamins and nutrients it needs to fight stress and boost your immune system. If you don't exercise on a regular basis or eat healthy then start by taking baby steps. If you keep up with it, you will soon have a new habit which turns into a lifestyle. I have been focusing on Minimalist Living a lot lately. It's amazing how getting rid of clutter in your house and life can seem to free up space in your mind. Do you really need 32 bath towels in your linen closet for a family of 4? I sure didn't. My boys loved donating many of them to the local animal shelter and I loved a less cluttered closet. I even de-cluttered my email. I unsubscribed to about 90% of my daily email subscriptions. I was receiving over 200+ emails a day and only opening about 5. It was way out of hand. For some reason, when that little email notification number rises, so does my blood pressure. Say "No" to negativity. You may not even notice how much negativity is around you every day. When I made a conscious effort to avoid it, when possible, I started to realize I had a lot more negativity in my life than I had originally thought. I stopped following negative people on social media. For me, this also included the news. I look for things to inspire me and make me laugh. I found that my mind doesn't wander into the most horrific situation possible as often any more. I had a handful of friends who pretty much only talked about negative things or made negative comments all of the time. I want to be around people who support me and inspire me to be a better person. I want to be that person to my friends, too. Healthy friendships are vital to your health. Healthy friendships provide you with a trusted source for 'talk therapy'. Sometimes, just saying something out loud can get it of your chest. Laughter is a great stress reliever! Sometimes, you just need to let go and laugh at little things. I'm easily entertained, so for me something as simple as autocorrect fails or videos like this. Like I said, I'm easily entertained. We also keep a 'Jolly Journal' and write anything funny our kids say or do. I love looking through it when I'm having a rough day. Always remember to seek professional counseling if you feel you cannot deal with the stress. They are there to help. If you need a recommendation, don't hesitate to ask. There is absolutely no shame in seeking professional help. Lastly, you need to find something you absolutely love and make sure you schedule time to do it every week. Yes, schedule it- make it a priority. It could be anything from painting, reading a book, going for a walk, meeting a friend for coffee, sitting on the deck with your spouse, meditation, baking, getting a massage- whatever you would consider "me time." Remember, you need to relax, renew & rejuvenate- you cannot pour from an empty cup. Now take a step back and look at your daily life. We cannot eliminate all stressors, but find one thing that causes you stress on a regular basis. Work on that this week. 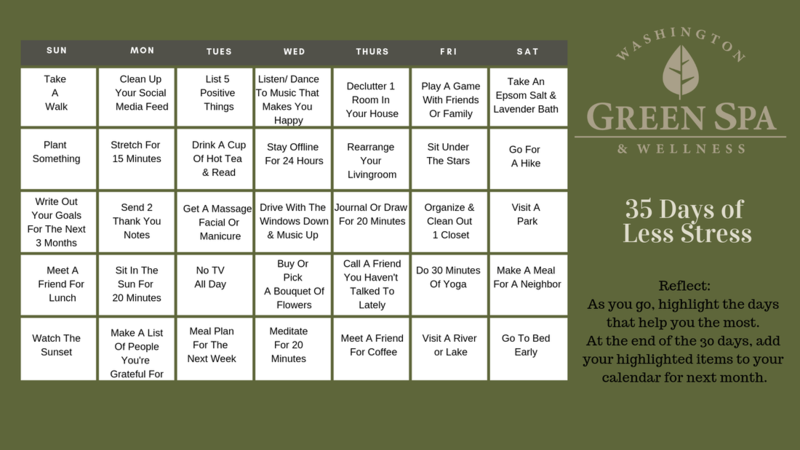 Need some ideas of something easy to implement into your life to help reduce tension and stress? Click the calendar to download and print your copy. Make sure to highlight the things you've tried that have made you feel the best. When you get to the end of the calendar, reflect on those highlighted items and add them to your calendar for next month. One last thing, schedule a little self-care time at the spa. It's been said that a 60 minute session at the spa is like 8 hours of rest for your body. Who couldn't use 8 hours or rest? We want to let you know we’ve got your back. 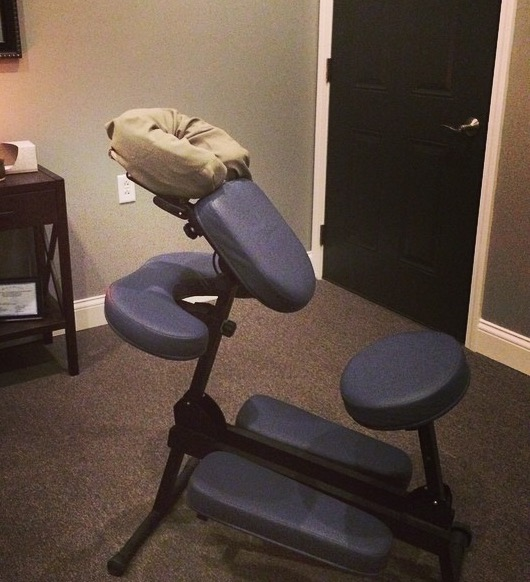 Chair Massage is a great way to take a needed break while helping alleviate some of the aches, pains and stressors that come with sitting at your desk for countless hours during tax season. 1. Contact us at 636-283-5105 to schedule the date & time. we require a minimum of 90 minutes per office visit. Price starts at $85 per hour, per therapist. Travel outside of the Washington area will incur an additional travel fee. *On-Location Chair Massage is also perfect for customer appreciation events, as a stress buster for bridal parties, as a Thank You for teachers and more! We look forward to bringing your much-needed stress relief in the near future! A trip to Washington Green Spa will certainly leave you feeling relaxed and rejuvenated. Our peaceful environment will soothe frayed nerves while invigorating your senses. But, what if you’ve never had a massage or facial before? We are guessing you might have some questions about what your spa trip might look like. This is totally normal. Doing something new is always a bit nerve-wracking. We want to make your experience as pleasurable as possible - even before you walk through our doors. 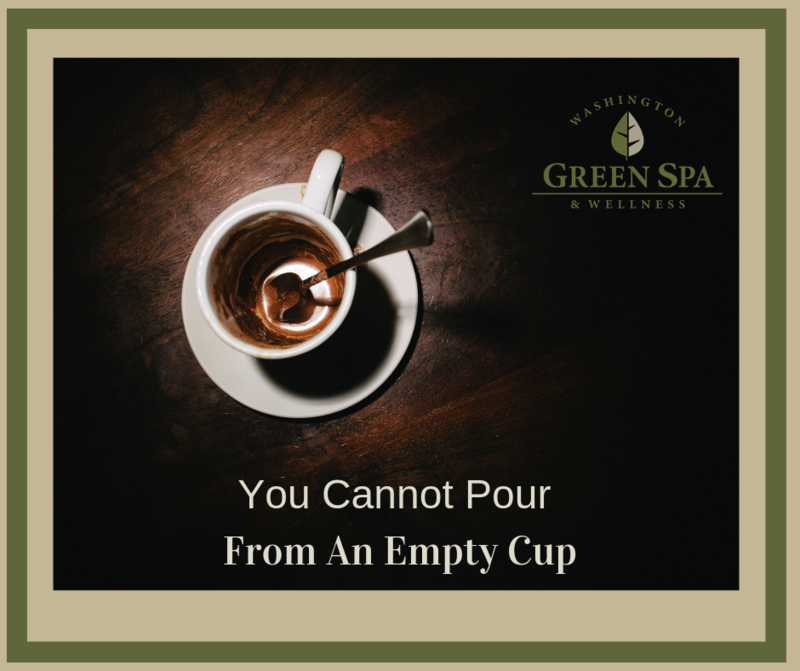 So let’s take a look at what you can expect from a trip to Washington Green Spa. As you enter, you will be greeted by a friendly, smiling face at our front desk. One of our lovely receptionists will help you get checked in and ready for your service. We ask that all clients fill out a short intake form. The information we gather from these forms will guide the massage therapist or esthetician in helping you to reach your goals. It also allows us to be sensitive to any allergies or areas of the body that need special attention during your appointment. When you schedule an appointment, a confirmation email will be sent to your inbox. In this email you will find a link to fill out the intake information online. This helps us in our mission to be a ‘Green Spa’. But, if you are unable to fill this out online, the receptionist will have the paperwork ready for you when you arrive. Arriving at the spa about 10 minutes early is plenty of time to fill this form out. Put your phone on silent so it won’t be a distraction during the service. Browse through our wide array of products in the waiting area. We have everything from chemical-free makeup to natural health products to salt lamps and more! To get the most out of your appointment you can close your eyes and take a few deep breaths. Being present during your service will help the relaxation benefits extend beyond your appointment. When the massage therapist or esthetician is ready, they will introduce themselves to you in the waiting area before guiding you back to their room. Each of our services is tailored to fit your needs. The massage therapist or esthetician will ask a few questions to get an idea of what you are wanting to work on during your service. Let the massage therapist know if you have any particular area you’d like them to target. Your goal might also to be to experience total body relaxation. If so, you can simply ask to have a full-body massage. This will work best with 60 minute (or longer) appointments. The massage therapist will leave you in the room to undress to your level of comfort. You will also want to remove any larger piece of jewelry that might be in the way. Get cozy under the blankets. The massage therapist will knock before entering again. It’s time to relax and enjoy your massage. Throughout the massage, be sure to let the therapist know if their pressure is too much or not enough, or if you are experiencing any unpleasant sensations in a particular area. No two facials are alike. Everyone’s skin is different. That is why our estheticians take a client-centered approach to each and every appointment. Let the esthetician know what skin problems you are experiencing. Often clients have a combination of skin concerns, which is why each person will receive a completely unique treatment of cleansers, masques, toners, serums, peels, and more. Once the esthetician leaves the room, you can undress to your level of comfort. Ideally, you will want to remove any articles of clothing above the waist to prevent oils or products to stain your clothing. You will be given wrap to wear under your arms like you would a towel when you get out of the shower. Once you are cozy laying face-up under the covers, you are all set to begin soaking up all the relaxing goodness of your first facial! As your service comes to a close, the massage therapist or esthetician will leave you to redress. You will find a couple of hand towels in your room to be used to wipe off any oils you don’t want to get on your clothes. Take your time as you get up and prepare for the rest of your day. Once you are dressed, grab your belongings and you can head to the front desk. The massage therapist or esthetician will meet you at there with a boxed water or hot tea. They may have recommendations on how soon you should return in order to reach your goals or products that would be beneficial for at-home use. If relaxation is your goal, we suggest clients schedule an appointment every 3-4 weeks. When you are all ready to leave you can pay for your service at the front desk with the receptionist. This is a great time to schedule your next appointment to keep yourself on track in reaching your goals. Feel free to bring a calendar or planner with you, and the receptionist will help you schedule your next appointment. It is truly our mission to help you feel relaxed and renewed as you walk out our door. Regular self-care is a huge piece in the health and wellness puzzle. We are pleased to be a part of your journey, and hope that you will look forward to coming back again and again. 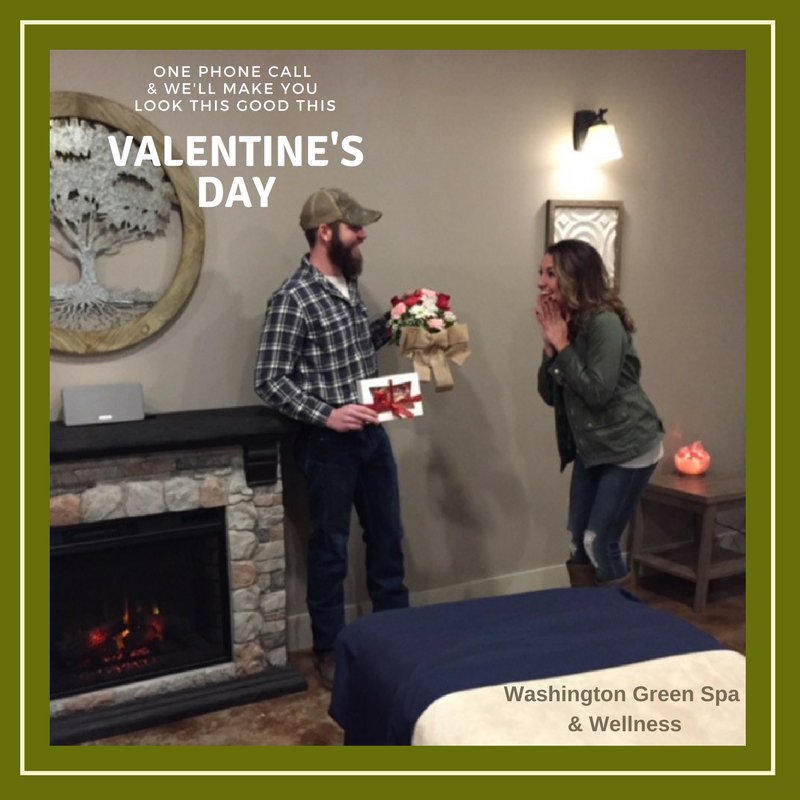 Now that you’ve walked through what you can expect from a visit to Washington Green Spa, we hope you feel at ease about trying something new and we cannot wait for you to experience our services in person! As the holiday season approaches, many are looking for the perfect gift. Not only the perfect gift, a gift that will be memorable. 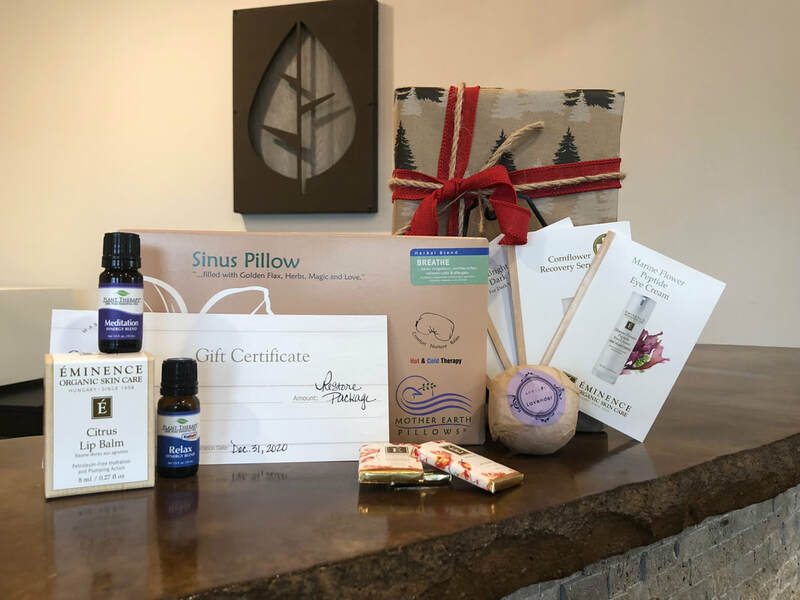 With many complaints of "too much stuff", we've created Gift Pack Options that focus on an experience with us at the spa and a few of our most popular items to further that experience in home. Experience based gifts are what many people are looking for this year as we find our houses accumulating more and more things we just don't use. Sounds like a great idea, but you don't want to try to figure out what to put together?Don't worry, we've made it super simple for you! All you have to do is pick which option is best for your gift recipient and we will put it together and even wrap it for you! Simple! ​We are sure they will love it! To view all Holiday Gift Pack Options and start crossing people off your list click here. That's the most common reaction when clients find out we offer this 'Four Hour Therapists Choice' gem of a service. The three and four hour Massage Therapists' Choice massage options were inspired by one of our fantastic clients. She loved coming in for her two hour sessions and telling me to do whatever I felt she needed that day. Sometimes we would throw in cupping, sometimes a body wrap, maybe a new service I was thinking about offering; it was never the same. Then we would occasionally bump it to a three or four hour session when she was celebrating hitting a goal or for her birthday. She was the one that encouraged us to offer it to the public. Why is it the Therapists Choice as to which modalities are used and not the clients'? Well, because we are the professionals. If we've worked with you in the past, we probably already have at least one or two things we know would benefit you. However, if there is something you absolutely love or something you've been dying to try- speak up! It's not a problem to add it to your treatment plan. It gets you to try services or add ons you may have never thought of and, as the client who inspired this service option says, "I love that I never know what's next! The smells, the textures and the everything keeps my senses on alert and my brain wondering what will I be treated with next." Anything and everything is included in the price so all you need to do is lay back and relax. After leaving a session like that your body feels like jello. Pure jello, without a care in the world. So what do you say? Does it sound like heaven? Are you ready to give it a try? We've learned so much about skin protection, but there is an alarming amount of people who go without apply sunblock on a daily basis. Ultraviolet radiation is linked to the vast majority of skin cancers, premature skin aging and even eye damage. We wouldn't want you to regret not having worn sunscreen when you look at your skin compared to friends and family who have worn daily sunscreen 20 years from now. 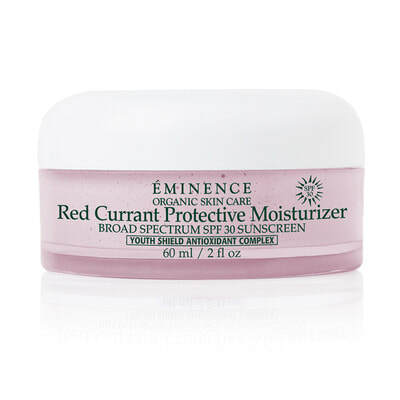 With our skincare line, Eminence, you can easily add SPF to your morning routine with your moisturizer. With three options, you're bound to fall in love with at least one! 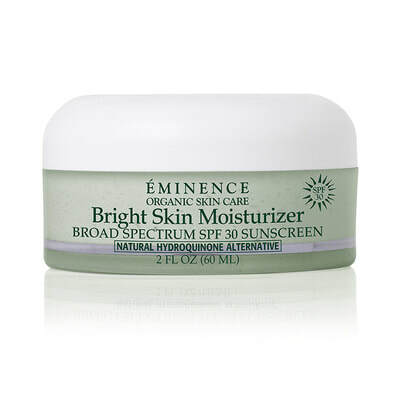 Lighten the appearance of dark spots while protecting against future damage with the built-in broad spectrum SPF. 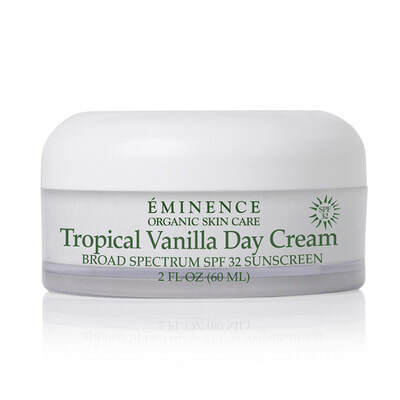 It is a great option for combination to normal skin types. A best seller! Experience a refreshingly cool sensation from sustained release tea tree oil which helps reduce the visible signs of breakouts, while hydrating and invigorating your skin's appearance. ​Whatever you decide, just make sure you use it on a daily basis for best results. You're skin will thank you! 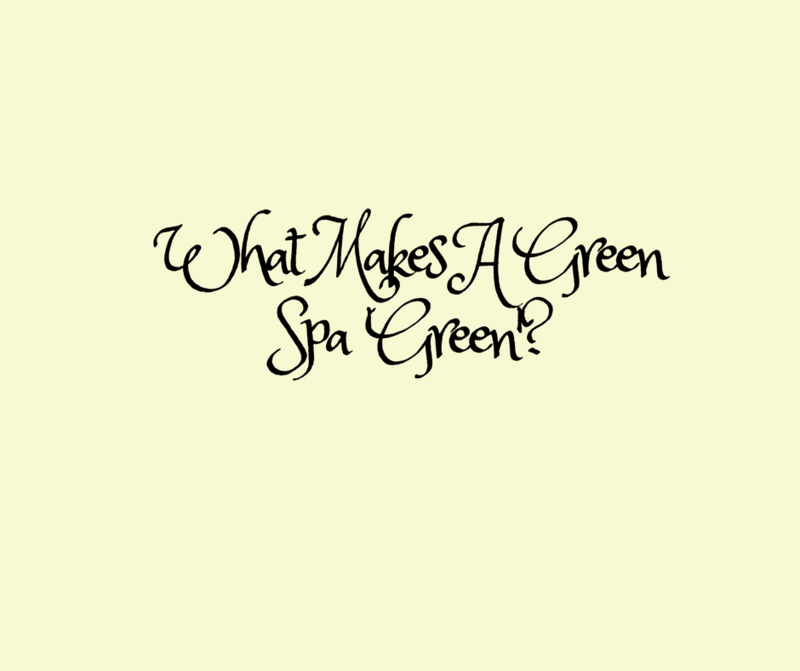 What Make a Green Spa 'Green'? General benefits of ‘Going Green’ include some of these factors: reduced health risks, improved public safety, improved thermal and acoustic environment, strengthened infrastructure, improved air and water quality, reduced solid waste, reduced dependence and use of fossil fuels, and promotes Alternative Energy Sources. To sum it up: it’s just the responsible thing to do. We are always looking for ways to become more Green and keep our list growing! I hope you were able to grab a tip or two to implement in your own office, home and life. Feel free to share any tips you may have for us. It's so easy to be upset when things do not go our way. 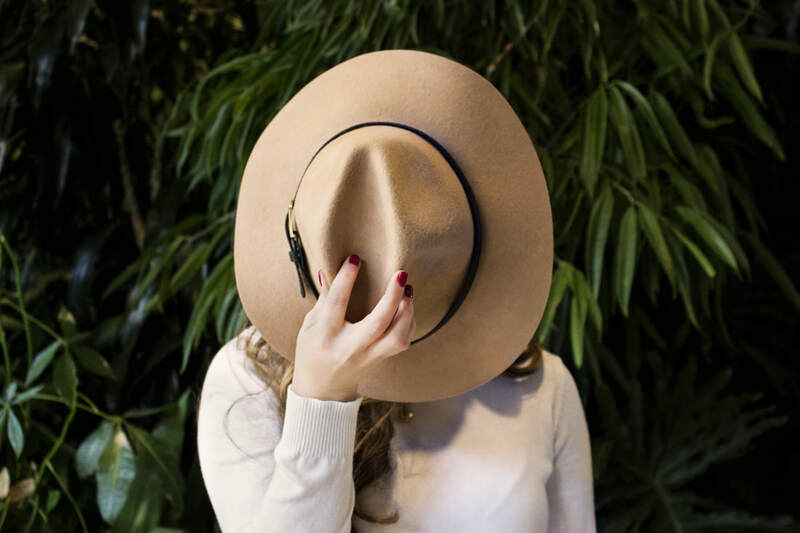 From the moment we spill our coffee, lock our keys in the car, and forget our lunch, a spiral of circumstances can set us off into a tailspin of negativity. We can choose to stay in a state of discontent and let that dictate our day, or we can be grateful for the other things in our lives even if they are not present in front of us right now. Keeping the focus on gratitude offers your mind something to smile about, regardless of outside circumstances. Focusing on people, places and even things that make you grateful, gives your mind a break from stress. Everyone has a busy schedule; that's a fact. We all tend to create schedules that are overflowing and then complain that we do not have time for ourselves! Take a good hard look at your schedule and see what you can delete and what you can delegate. If you are going to have a healthy mind, you need to take care of it just as you would your body, and that means giving it some rest. One tip for quieting your mind is to put it on your schedule. Put it in beg red pen on your calendar, text yourself a reminder, and place it on your list of things to do this week. Take time for you. 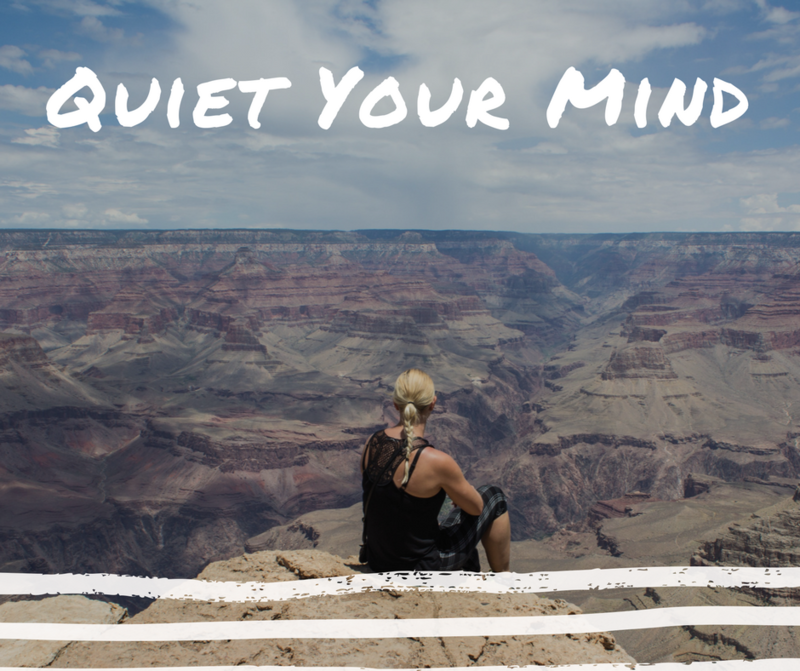 Being in the moment has become cliché; however, if you really take the time to focus on what it means, you can start to practice quietening your mind. Focus on what you are doing at the exact moment you are doing it. If you are washing a dish focus on the water, the soap bubbles and the dish is in your hand. When you take time to do this, you will be in the moment and not two days from now when something big is scheduled.